Like your body performs best on a healthy diet, keeping your car topped up with oil, coolant and more will help it run at its best. Basic car maintenance will also help you spot any problems and potentially save your bank account come service time. Here are a few key things to keep an eye on. Checking your car’s oil level is an essential car maintenance step that’s often forgotten or overlooked. Keep an eye on this and you may end up saving yourself lots of money in the long run. Oil is obviously vital to the optimal functioning of your vehicle; if it doesn’t have enough oil, it could break down, or worse. It’s also worth keeping some spare oil handy (but of course it’s a fire hazard so keep it in a very safe area away from children). Never check your oil when the engine is still hot from driving as it may splutter and burn you when you open the cap. Rather, get into the habit of checking your oil before you hop in the car to drive somewhere, and keep an old rag close by to clean your hands afterwards. Make sure your car is on level ground, then open the bonnet. Locate the dipstick, pull it out and wipe it clean with the rag, then push it back in again. This time when you pull it back out, you can check where the oil comes up to — if it’s between the low and high marks, then you’re fine. This area is normally shaded, textured or marked by dots or letters. The reason for disregarding the first reading of the dipstick is because the oil will have moved around while you were driving and could give a false reading. Coolant is another thing your engine simply can’t run without. Again, make sure your car has completely cooled down before checking this liquid. Locate the semi-transparent coolant bottle and check if the liquid inside is sitting between the low and high marks. If it is, you don’t need to do anything. If you’re having trouble finding the coolant bottle or oil dipstick, check your car manual for a diagram. All tyre makes and models require different tyre pressures to perform at their best, so make sure you check exactly what your vehicle needs. Low tyre pressure not only affects how much fuel your car chews through, but it also makes the car harder to drive. Aim to check your tyre pressure once a week and refill them at the air tank at your local service station or replace them when necessary. 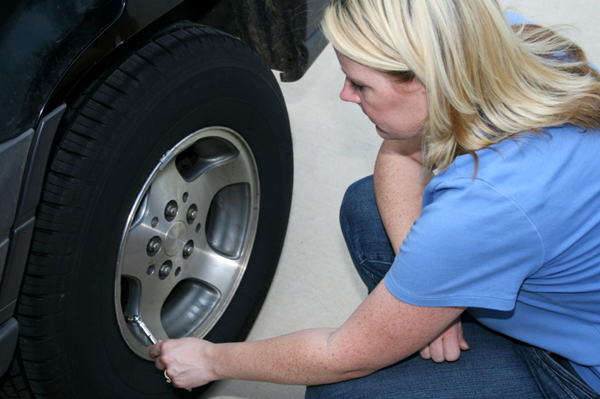 Just as tyre pressure affects how well your tyres run, so does the surface of your tyres. Bald tyres, for example, are very dangerous and mean that they won’t stick to the road or brake as well, and may slip and slide in wet weather. Have your tyres checked by a pro if you’re concerned. Every now and then, get into the habit of checking all your lights and indicators are working. Bribe the kids into coming outside and being your monitors as you turn each one on and off. If one indicator is flashing faster than the other, it usually means that a lightbulb has blown. It’s wise to get into the habit of checking your car for scratches and rust. Getting in early and treating minor issues before they spread into huge problems could save you hundreds of dollars in the long run. You should also considering making a ritual of a regular wax and polish. No only will your car look a whole lot better and cleaner, but it will also help protect the car’s paintwork from fading and means that when debris (e.g. bird poo or tree sap) falls on your car, you’ll be able to clean it off a whole lot easier. You can buy wax and polish supplies to do the job yourself (these products have come leaps and bounds in recent years) or hire an expert to do it for you. Check your mechanic’s stickers in your car or vehicle care book to check when your next service and tyre rotation are due. Make notes in your diary and set up reminders on your phone so you don’t miss these super important dates.